Other Features Normal Elements of a Real Estate Purchase Agreement Are Included, Including Proration of Taxes, Utilities, and Club Contracts, Etc. 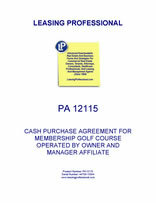 THIS PURCHASE AND SALE AGREEMENT (this “Agreement”) is made to be effective as of the ____________, 20__ (the “Effective Date”) by and among GOLF COURSE ACQUISITION COMPANY, a ____________ limited liability company, (the “Purchaser”), whose address is ______________________________________, and GOLF COURSE OWNER , a ____________ limited liability company (“Owner”) on behalf of itself and its wholly owned management subsidiary GOLF COURSE MANAGEMENT COMPANY, a ____________ limited liability company (“Manager”), whose address is ______________________________ (collectively, the “Seller”). A. Seller is the fee simple owner of certain real property on which a golf course is located, including related improvements and amenities, and personal property in ____________ County, ____________, commonly known as “_______________ Country Club” (the “Club Facilities”), the legal descriptions of which are attached hereto as Exhibit A. B. Manger, a wholly owned subsidiary of Owner, is currently managing the operations at the Club Facilities. C. Purchaser desires to purchase from Seller, and Seller desires to sell to Purchaser the Conveyed Property (as defined below) upon the terms and conditions set forth herein. 1.3 “Agreement” shall mean this Purchase and Sale Agreement. 1.4 “Applicable Law” means any federal, state, or local statute, resolution, ordinance or other law in the jurisdiction where the Land is located without regard to conflict-of-law principles. 1.5 “Assignment of Club Documents” shall have the meaning set forth in Section 6.7(a)(ix) below. 1.6 “Assignment of Intangible Property” shall have the meaning set forth in Section 6.7(a)(iv) below. 1.7 “Board Approval Date” shall have the meaning set forth in Section 5.6(a) below. 1.8 “Bill of Sale” shall have the meaning set forth in Section 6.7(a)(iii) below. 1.9 “Closing” shall have the meaning set forth in Section 6.1(a) below. 1.10 “Closing Date” shall mean the date the Closing takes place, which shall be on or before _________, 20__, or one hundred twenty (120) days after the Effective Date, whichever is later, unless otherwise mutually agreed upon in writing by Seller and Purchaser. 1.11 “Closing Documents” shall have the meaning set forth in Section 6.7 below. 1.12 “Club Facilities” shall have the meaning set forth in Recital A above. 1.13 “Confidentiality Agreement” shall have the meaning set forth in Section 9.5 below. 1.14 “Conveyed Property” shall have the meaning set forth in Section 2.1 below. 1.15 “Deed” shall have the meaning set forth in Section 6.7(a)(i) below. 1.16 “Due Diligence Period” shall have the meaning set forth in Section 4.1 below. 1.17 “Earnest Money” shall have the meaning set forth in Section 2.4(a) below. 1.18 “Earnest Money Deposit” shall have the meaning set forth in Section 2.4(a) below. 1.19 “Effective Date” shall have the meaning set forth in the introductory paragraph to this Agreement. 1.20 “Escrow Agent” shall mean _______ Title Insurance Company. 1.21 “Escrow Agreement” shall mean that certain Escrow Agreement by and among Seller, Purchaser, and Escrow Agent. 1.22 “Excluded Assets” shall mean those assets listed on Exhibit H attached hereto. 1.23 “Excluded Obligations” shall have the meaning set forth in Section 2.2 below. 1.24 “Existing Phase I” shall have the meaning set forth in Section 4.1(a)(ii) below. 1.25 “Existing Survey” shall have the meaning set forth in Section 4.1(a)(i) below. 1.26 “Existing Title Commitment” shall have the meaning set forth in Section 4.1(a)(iv) below. 1.27 “FF&E” shall mean all articles of tangible personal property, whether in use or held in reserve storage for future use in connection with the operation of the Club Facilities located at the Club Facilities, including but not necessarily limited to all golf carts and other vehicles, lawn mowers, ball machines and other driving-range equipment, computers, cash registers and other similar equipment, inventory-control systems, and other fixtures, furniture, furnishings, fittings, equipment, machinery, apparatus, appliances, as well as all golf clubs, bags, shoes and other golf equipment for rent, driving range balls, china, glassware, linens, silverware, kitchen and bar small goods, paper goods, guest supplies, cleaning supplies, operating supplies, printing, stationery and uniforms. A list of FF&E forms part of Exhibit B attached hereto. 1.28 “Final Statement” shall have the meaning set forth in Section 6.2 below. 1.29 “Food and Beverages” shall mean all food and beverages (alcoholic and non-alcoholic) whether in use or held in reserve storage for future use in connection with the operation of the Club Facilities in the ordinary course of the business of operating the Club Facilities. 1.30 “Food and Beverages Cost” shall mean the actual cost of all fresh first quality Food and Beverages which are unopened or otherwise in the condition as delivered and ready for use, excluding the cost of all items which are opened. 1.31 “Club Contracts” shall mean all golf pro, tennis pro, and other employment contracts, management agreements, membership agreements, priority tee time agreements and other similar agreements affecting the use and operation of the Club Facilities, group, frequent player or other similar discount arrangements or commitments, group, tournament and other facilities and clubhouse bookings and reservation agreements, water, sewer or other utility agreements, landscaping, maintenance and other service contracts, union contracts, collective bargaining agreements, employee benefit plans, golf cart, maintenance equipment, telephone and other equipment leases, and other contracts or agreements relating to the maintenance, operation, provisioning or equipping of the Club Facilities, together with all related written warranties and guaranties. A list of all Club Contracts is attached hereto as Exhibit K.
i. All product and service warranties and guaranties. The above-described Land, Improvements, Tangible Personal Property, Permits and Licenses, Water Rights, Mineral Rights, Intangible Property, appurtenances, personalty, property, rights, interests and properties and property referenced in Subsections a through i of this Section 2.1 are hereinafter collectively sometimes referred to as the “Conveyed Property” (which is synonymous with the “Club Facilities”). The Conveyed Property shall exclude the Excluded Assets. 2.2 Assumption of Obligations. Seller acknowledges that it will continue to be responsible for any of Seller’s liabilities or obligations related to the Conveyed Property arising and accruing prior to the Closing Date, unless otherwise expressly agreed to herein. The Purchaser agrees to assume all of Seller’s rights, duties, and obligations under the Space Leases, the Club Contracts, and the Permits, accruing from and after the Closing Date, except for those obligations expressly excluded in Exhibit 2.2 attached hereto (the “Excluded Obligations”), which shall remain the obligations of the Seller from and after the Closing Date. The assignment and assumption of such rights and obligations shall be evidenced in the Assignment of Intangible Property. a. Delivery of Earnest Money Deposit. On or before three (3) business days following the Effective Date, Purchaser shall deliver or has delivered to Escrow Agent by wire transfer of immediately available good funds the amount of $____________, and such amount (together with any interest earned thereon) shall be considered earnest money (the “Earnest Money Deposit”) under this Agreement and shall be fully refundable to Purchaser during the Due Diligence Period in the event Purchaser chooses not to proceed with the purchase hereunder. The Earnest Money Deposit, as applicable, shall be referred to herein as the “Earnest Money”. Subject to the provisions of Article 5 below and Purchaser’s right to terminate this Agreement in its sole and exclusive discretion under Section 4.1(d) , the Earnest Money shall be non-refundable to Purchaser in the event that Purchaser does not close under this Agreement in accordance with the terms of this Agreement. In the event that one of the Purchaser Closing Conditions or Mutual Closing Condition is not satisfied prior to Closing, or termination of this Agreement for any other reason except default by Purchaser, the Earnest Money shall be refundable to Purchaser. ANY EARNEST MONEY PAID TO OR RETAINED BY SELLER AS LIQUIDATED DAMAGES UNDER THIS AGREEMENT SHALL BE SELLER’S SOLE MONETARY REMEDY IF PURCHASER FAILS TO CLOSE THE PURCHASE OF THIS PROPERTY. THE PARTIES HERETO EXPRESSLY AGREE AND ACKNOWLEDGE THAT SELLER’S ACTUAL MONETARY DAMAGES IN SUCH EVENT WOULD BE EXTREMELY DIFFICULT OR IMPRACTICABLE TO ASCERTAIN AND THAT THE LIQUIDATED DAMAGES (I.E., THE VALUE OF THE EARNEST MONEY) STATED ABOVE REPRESENTS THE PARTIES’ REASONABLE ESTIMATE OF SUCH DAMAGES. THE PAYMENT OF ANY SUCH DEPOSIT BY PURCHASER TO SELLER AS LIQUIDATED DAMAGES IS NOT INTENDED AS A FORFEITURE OR PENALTY, BUT IS INTENDED TO CONSTITUTE LIQUIDATED DAMAGES TO SELLER. b. Payment of Purchase Price. At Closing, Purchaser shall pay to Seller the Purchase Price, in cash (i) less the Earnest Money, which shall be remitted by the Escrow Agent to Seller at Closing and credited against the Purchase Price, (ii) plus or minus adjustments and prorations as provided in Section 6.2.
c. Food and Beverages and Pro Shop Inventory. In addition to the foregoing, at Closing, Purchaser shall pay cash for Food and Beverages Cost and Pro Shop Inventory Costs as described in Section 6.2(b). 2.5 Allocation of Purchase Price. Seller and Purchaser agree to cooperate in allocating the Purchase Price between land and improvements, the buildings, and equipment and other personal property prior to the Closing Date. xv. the most recent title policy(ies) covering the Property. The materials described in this Section 4.1, collectively, shall be referred to herein as the “Seller Due Diligence Materials”. b. Purchaser shall be entitled to review and either accept or reject anything contained in the Seller Due Diligence Materials. Any objection to any portion of the Seller Due Diligence materials shall be presented to Seller in writing detailing the bases for the objection. Subject to the provisions of Section 4.2, any objection to any portion of the Seller Due Diligence Materials not presented to Seller on or before thirty (30) days after the Effective Date shall be deemed waived. c. Purchaser is entitled to inspect all pertinent books, records, proformas, plans, and cost estimates, as well as any other documents, surveys, building plans, leases, contracts, environmental permits, title policies, and other materials relevant to the Conveyed Property, and may undertake or cause to have undertaken, at Purchaser’s sole cost and expense, whatever tests, studies and due diligence investigations related to the Club Facilities as Purchaser may determine in Purchaser’s sole discretion and obtain written reports thereon, including without limitation structural investigation of all buildings located on the Conveyed Property, soil testing, update of the Existing Survey or Existing Phase I Report (the “Purchaser Due Diligence Materials”). On or before thirty (30) days after the Effective Date, Purchaser shall furnish Seller a copy of an updated Existing Phase I and notify Seller of its objections to any matters contained in the updated Existing Phase I. In the event Purchaser determines that a Phase II environmental report is necessary, Purchaser, at its expense, must order the Phase II environmental report within three (3) business days of its receipt of the updated Existing Phase I.